The MedTech Innovator Showcase and competition finals will once again be a part of The MedTech Conference in San Jose, CA on September 25 - 27, 2017. This showcase will feature 50 transformative, early to mid-stage device, diagnostic and digital health companies. These selected companies will present to a panel of judges in the main Exhibit Hall. Each Showcase will group four to five of the companies under a common theme. Video introductions will be used to present each company’s investment and technology opportunity, and the CEOs and Founders of each company will present on a panel of judges with business executives and investors. Applications are reviewed by more than 50 leading companies, including manufacturers, providers, and investors such as Johnson & Johnson, RCT Ventures, BD, Baxter, Abbott, Sofinnova Partners, Medtronic, Windham Venture Partners, Edwards Lifesciences, and Aphelion Capital. The top 100 companies move on compete in 10 regional Pitch Events in the United States and Europe throughout March and April. Pitch Event winners progress to the opportunity to be selected for the Showcase, Accelerator and three competitions: the first is April 26 at the MedTech Strategist Innovation Summit in Dublin, Ireland; the second is June 2 at the Wilson Sonsini Medical Device Conference in San Francisco; and finally, the Showcase and Finals at AdvaMed 2017 in San Jose, Calif., from Sept. 25 to 27. MedTech Innovator 100 – 100 companies are invited to compete at regional Pitch Events, gain access to online accelerator resources, and receive complimentary registration to the AdvaMed Accel Leadership Seminar on day one of AdvaMed 2017. MedTech Innovator Showcase – 50 companies are additionally awarded a slot in the MedTech Innovator Showcase at AdvaMed 2017 and full access registration to the conference. MedTech Innovator Accelerator – 20 companies are selected to the industry’s leading accelerator program as the class of 2017, including four months of mentoring, exclusive participation in the three-day MedTech Innovator Accelerator Kick-Off in San Francisco, and a chance to compete onstage for cash prizes. 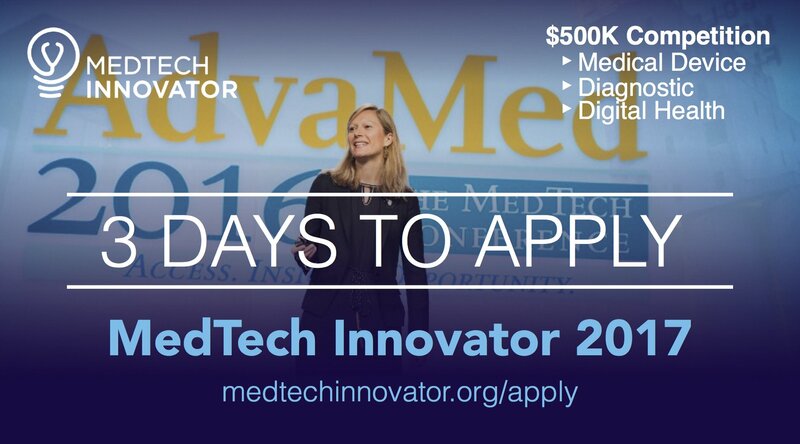 To apply for the MedTech Innovator competition and scholarship, visit medtechinnovator.org.